Dogwood dogs, Bertie Beetle show bags, fireworks display, and a whole day of fun and relaxation! 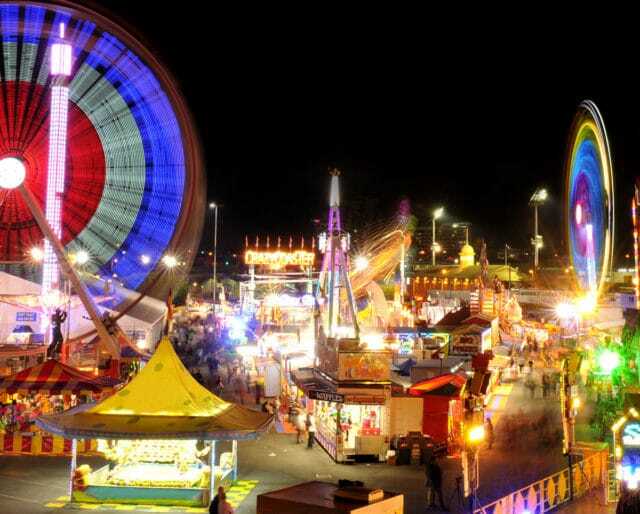 If you’re from the Sunshine State, you know what we are talking about — the Royal Agricultural National Show Day — or the Ekka! Every year it takes place on the second or third Wednesday in August at the Brisbane Showgrounds. (August 15 in 2018.) It’s a public holiday in Queensland and the festival lasts 10 whole days. Great food, awesome rides, prize-winning animals, crafts, a grand parade, and night show with spectacular fireworks! No wonder the happy people of Queensland are so proud of this event. This year was pretty exciting for those who are awestruck by blue blood. Queen Elizabeth II and Prince Phillip visited the show. "Royal" gets added to the name of the event and it has stuck to this day. King George V granted the show a royal warrant. The Ekka provided the venue for the first manned flight over Brisbane. The Royal National Agricultural and Industrial Association created the first show to promote agricultural, industrial and cultural resources. The first Ekka attracted about 17,000 visitors and boasted of 1,700 individual exhibits. Organize a family and friends’ meetup and celebrate this day together. The more the merrier. Get into the spirit! Our future depends on sustainable agriculture. May we suggest wearing loose, organic cotton, and a smile. Get kids to record everything they see on their favorite gadget: their phone! Where their clothes and foods come from, interesting facts about animals, and about plants, etc. Now they have something to show and tell in school. About 400,000 visitors come to the Ekka each August and some of them are foreign tourists. And with good reason! The show was canceled because of the Spanish flu in 1919 and World war II in 1942. The first Royal Agricultural National Show was a grand event; men wore suits and ladies showed off their finest clothes. By the year 2020, half of the world’s population will be looking to Australia for its food needs. Shows like this one connect farmers to the latest in agricultural innovation. The future depends on this. Around 1.6 million jobs in Australia depend on agriculture — which gives us 1.6 million reasons why agricultural events should be promoted. Yes, they do! And they deserve it. But the event is so much fun that besides farmers, people from Queensland and all over the world flock to it. This is a great opportunity for farmers to learn about the government’s agricultural initiatives and the innovations in agricultural science. The event gives people a chance to experience the interesting culture of the region. And nothing binds the community together like good food and fun.